The new Sport Plast Upright Cormorant Floater is no longer collapsible. 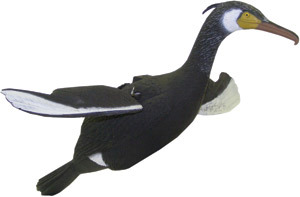 This excellent 28.5” long cormorant decoy is made of rigid plastic and has a realistic paint job. This decoy is the 2nd decoy to target the Cormorant a very prolific bird that has become a major problem for many area's. This flying version along with the standing version will help those that have permits from the USFWS to hunt. 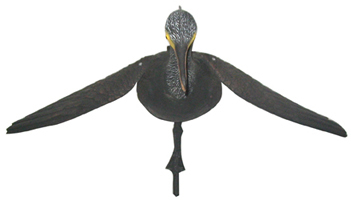 This decoy measures 32" from beak to tail and has a wing span of 36". Stake is included. 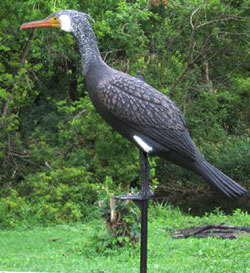 This is a first for the decoy market a CORMORANT DECOY, this decoy can be used for a confidence as it will help your hunting area look more natural if you have many of these very prolific birds in your neighborhood. Sport-Plast also made this decoy available just in case that USFWS de-lists this problem bird and allows hunting. This decoy measures 32" from beak to tail.